If you say that visitors can do anything they like—and we do say that—then you can’t be surprised at anything they actually do. At-Bristol, in the United Kingdom, has 250 exhibits and receives 250,000 visitors per year. If each exhibit is used only once in a visit, then the science center has 62.5 million visitor/exhibit interactions every year. So “one chance in a million” is more than one accident every week. One bad accident could close a museum. 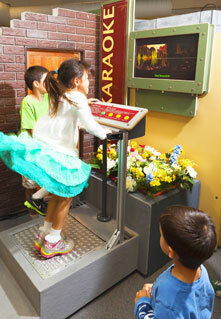 All science centers and museums want visitors to explore and interact with exhibits. We want them to be engaged, not wrapped in a cocoon. But we don’t want accidents, especially ones that could seriously injure someone, damage a reputation, or lead to a lawsuit. At the Sciencenter in Ithaca, New York, and At-Bristol, we continually have conversations among our staff and with other museums about safety and managing risk. Where should museums draw the line? In part, each museum has to make its own decisions about visitor safety, based on factors such as local liability and insurance concerns, audience, reputation, and ownership. There aren’t any official museum guidelines for exhibit safety, but museums can draw on other resources to minimize the risk of accidents. Click here for a document listing a variety of safety products, books, standards, organizations with helpful information, and sample accident report and risk assessment forms. Ensure an exhibit doesn’t have loose wires or cords, exposed wires, or shock hazards. For example, building inspectors in the United States tend not to like extension cords on permanent exhibits. In countries with unprotected electrical outlets, place child safety covers in all unused outlets. Secure electrical plugs that aren’t hidden behind a cabinet. Put live, high-voltage electrical connections in approved covered boxes inside a cabinet. For exhibits that incorporate water, use special electrical outlets designed for use with water. Two such outlets are ground fault circuit interruption (GFCI) outlets and residual current detector (RCD) outlets. Become familiar with your national electrical code. Some countries have very stringent electrical requirements and so-called “mains testing,” which involves expensive equipment. Rounding: Avoid sharp corners or parts. Assess materials for splinters. Remove or fix loose or exposed screws (heads or tips). Openings: Be aware of head entrapment hazards. Any opening or space of 3.5–9 inches (8.9–22.9 centimeters) is large enough for a child’s body to fit through, but their head could get stuck. For more information, see the U.S. Consumer Product Safety Commission’s Public Playground Safety Handbook, pages 46–57. Navigation: Remove any tripping hazards and avoid the possibility of overcrowded spaces. Upstairs galleries: For exhibits near railings or low walls overlooking a downstairs area, remove parts that could be dangerous if they fall or are thrown down. Remove step stools from near railings. Don’t put exhibits that can be climbed on near balconies. Stability: Ensure that parts of an exhibit won’t tip or fall over and that cabinets are stable if visitors lean on them. Firmly attach narrow or unstable cabinets to the wall. Pinching: Assess any pinch points and places where hair or fingers could be caught while a visitor operates an exhibit. Protrusions: Assess hardware, such as handles, knobs, and hooks, to ensure that nothing can catch clothing or cause cuts or eye injuries if a visitor falls against it. Remember that children look at and use exhibits from a much lower level than adults. Assess any protrusions or projections with playground protrusion gauges. For more information, see the Public Playground Safety Handbook, pages 45 and 49. Lighting: Ensure that very bright lights from shadow exhibits, video projectors, etc., are safe for visitors. In addition, lasers must be eye safe, and strobes must not induce epilepsy. Special features: Identify safety issues on exhibits that use features such as water (it may need to be treated), gas, vessels under pressure, chemicals, or biohazards (live animals that may carry Salmonella bacteria, for example). You need to address these issues on a case-by-case basis. Use common sense and look for any other safety issues. Before allowing an exhibit onto the exhibition floor, it needs to be inspected. One of the best ways to inspect an exhibit is simply to give it a “real world” test. For example, try stroking the exhibit for rough spots or sharp corners and dropping parts of the exhibit on your foot. If possible, have two people inspect an exhibit. For each of its exhibits, At-Bristol keeps a risk assessment form that weighs risks and the likelihood of an accident happening. A copy of this form is available in the safety resources document. Finally, it is very important to keep records for any accidents that do occur. At the Sciencenter, anything that requires assistance, from a splinter to a fall, gets documented in an accident report filled out by a trained staff member. An example report is available in the safety resources document. The list of items to consider when designing and maintaining exhibits may be long, but we believe that not only will your board of directors and insurance agents be happier, but also visitors who feel safe will enjoy their visits more, visit more often, and be more comfortable exploring in depth. Kathy Krafft is traveling exhibitions curator at the Sciencenter in Ithaca, New York, and Harry White is science center consultant at At-Bristol, England, the United Kingdom. They have each been developing exhibits for more than 20 years. About the image: Visitors safely enjoy the Quake Karaoke exhibit, part of the Sciencenter’s traveling exhibition When the Earth Shakes. The exhibit was built with safety features such as enclosed wiring, rounded edges, interior cushioning, and no pinch points. Photo by Gary Hodges Photography.